Clad Metal India Pvt. Ltd.
We are a leading manufacturers, suppliers and trading firm indulged in fulfilling the requirements of our customers with this range of industrial standard Electrical Surface Boxes. This range has been made by us as per the standards of the industry and are offering this range in the most comprehensive and industry leading prices. 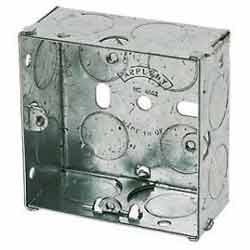 We have fabricated this range using best grade material in order to keep the quality intact. Looking for Electrical Surface Boxes ?